Conventional wisdom on the forums is that you Must use apertures of f1.2, f1.4, or at least f2.8 to get good Bokeh. Well, yes, using those apertures will yield great Bokeh when conditions are right. But, these same Bokeh fanatics lead people to believe that you can’t get good Bokeh at any other apertures or that you must own an 85mm f1.2 or f1.4 or the 50mm f1.2 or f1.4 lens to achieve the best results. 1st Priority – Use the proper f-stop for the subject; depends on how much depth-of-field is needed. 2nd Priority – Is to blur out the background with good Bokeh. What 25 years of doing portraits professionally has taught me is that I must deliver a successful portrait session EVERY time, so I do not take chances with depth-of-field. 1) The pose on an individual determines the f-stop. a. With the subject turned in a 2/3 view of the face my f-stop if f4.0 to f4.5 – if you do this very useful pose at f2.8 (don’t even think about f1.2 or f1.4) you will often loose focus on the subject’s far eye. b. If you pose your subject flat to the camera with them looking squarely into the camera—probably the worst pose for most people, since it will add weight to the face and body—sure you can open up and use a wider aperture like 2.8 or wider, but then, in most cases, you’re then sacrificing your subject on the altar of Bokeh! 2) How many layers of people you have determines the f-stop with group portraits. These apertures are based on the depth-of-field I know I get when using my portrait lens (the 70-200 f2.8) because as you can see from my most used focal lengths I rarely go below 135mm even for groups. That’s because most people look better, especially in groups, when using a telephoto lens, due to compression distortion. That is exactly why I don’t use the 85mm or much worse the 50mm lens for portraits due to the extension distortion it creates when you move closer to fill the frame properly. People never look good when subjected to extension distortion, but more on this topic in a future blog on lens choice for portraits. 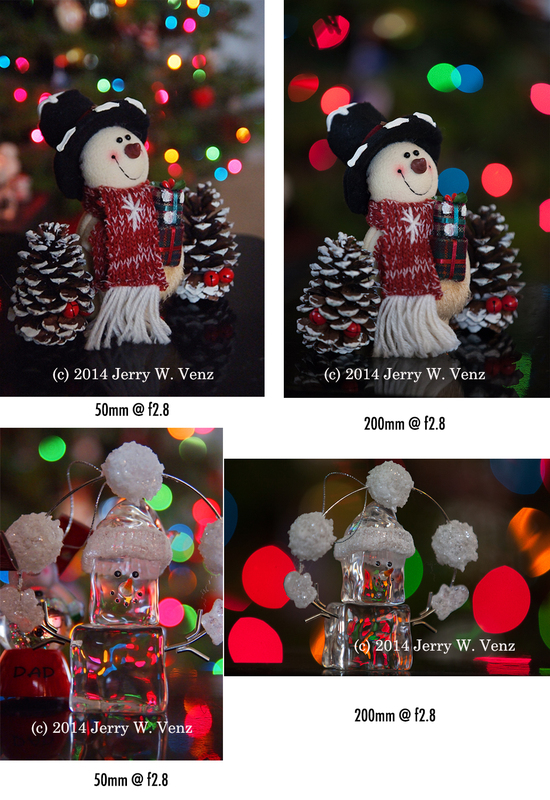 The following image pairs show dramatically how the focal length affects Bokeh at the same f-stop. Note: The distance from the subjects to the background was the same; the only change was the distance of camera to subject to equalize the size of the subject in the frame. Below are some of our typical portraits using my preferred focal length and f-stop combinations and the effect on background Bokeh. If you should have questions please don't hesitate to leave a comment.